Mumbai: The Securities and Exchange Board of India (Sebi) on Monday directed stock exchanges to initiate action against 331 listed entities suspected of being shell companies. Of them, 162 were actively traded; 169 had already been suspended. Some of these companies immediately protested against the regulator’s move, pointing to their operating and dividend-paying track record, and said they would seek a legal opinion. According to a Sebi notification, the shares of these companies will be traded only once a month until stock exchanges ascertain whether these are genuine companies or structures meant for fund diversion and tax evasion. The exchanges have been asked to independently audit these firms, and if necessary, appoint a forensic auditor. Markets fell after the announcement. The BSE’s 30-share Sensex closed down 259.48 points, or 0.8%, at 32,014.19 points. The National Stock Exchange’s 50-stock Nifty closed 78.85 points, or 0.78%, lower at 9,978.55 points. Sebi’s communique said the regulator had based its decision on a letter from the ministry of corporate affairs (MCA) identifying these 331 firms. It is not immediately clear how the MCA shortlisted these firms; the list of firms released by the ministry mentions that the income-tax department, serious fraud investigation office and early warning systems played a role. “These companies were identified by a panel formed by government of India post-demonetization. The 331 companies saw high investments through layering and fund flows from non-listed shell companies," said a ministry official on condition of anonymity. Out of the 331 companies, 162 were actively traded on BSE Ltd (the rest were suspended due to penal reasons) and 48 were traded on the NSE. The total public float of the 331 companies, according to the BSE, is Rs12,000 crore. At least 13 firms had a market capitalization of more than Rs300 crore each. Sebi capped upward price movement at the level of the last-traded price for these stocks. Any buyers will have to make a deposit equal to double the value of the trade. At least 162,000 companies that have not been carrying out business activities have been deregistered and a series of actions are being taken against shell firms, finance minister Arun Jaitley told the Lok Sabha on 21 July, according to a Press Trust of India report. The Companies Act and the Sebi Act do not define shell companies, although the income-tax department raises red flags when it notices certain patterns such as negligible business activity and unclear beneficial ownership. Experts questioned the process which Sebi followed for banning these firms. “Shell companies are not defined under any law so the basis of calling these companies shell is not clear. 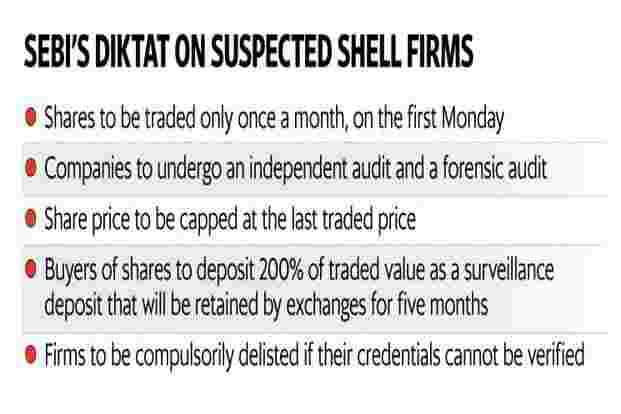 Even if (they are) shell (firms), if they do not violate any law, Sebi should not be taking what is clearly punitive and pre-emptive action, even without a hearing," said Sandeep Parekh, founder of law firm Finsec Law Advisors. “The vagueness in identifying these companies as shell extends to naming a company which is involved in the Mumbai Metro project and nearly a dozen other operating and profitable companies." In a notice to the stock exchanges, Parsvnath Developers Ltd, one of the 331 firms, said it was “one of the largest real estate development companies in Northern India". “We are not a shell company and suspicion is uncalled for. We are seeking legal advice in the matter and we are approaching the regulator, ie Sebi, requesting it to recall its directions," said J. Kumar Infraprojects Ltd.
Prakash Industries Ltd, Pincon Spirit Ltd and SQS India BFSI Ltd also sent stock exchange notices expressing shock and pointing to their operating track record. Sebi’s action may have been aimed at protecting investors, said one expert. “This is to protect shareholders’ interest keeping in mind that in many such places, promoter shareholding may be disguised as public shareholding and retail investors fall in a trap," said J.N. Gupta, co-founder and managing director, Stakeholder Empowerment Services, a proxy advisory firm. “Such a drastic action can only be taken after enough fact-finding and in today’s time and age more data bases are talking to each other to have more facts at hand," said Prithvi Haldea, chairman and managing director of Prime Database. “Certain parameters would have been used by MCA such as no business activity and only balance sheet activity, below the line income, profit could be non-business income, share price rise would not be in-sync with business activity, huge amount of circular trading and operator driven stocks. These factors would have made the regulators come to a conclusion that these companies not fit for the market."